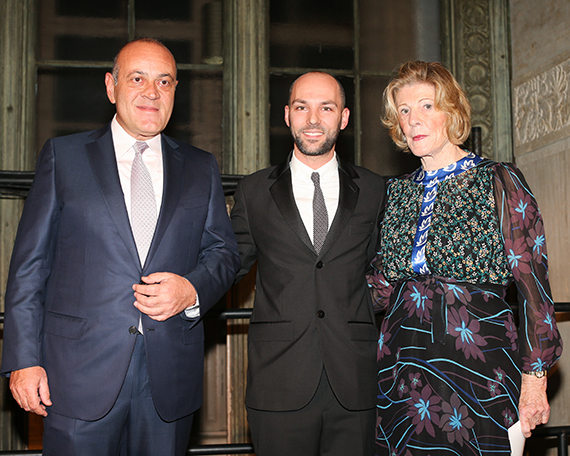 Independent Curators International (ICI) honored Mr. Dimitris Daskalopoulos, a Greek entrepreneur and contemporary art collector, with the Leo Award, at their annual Benefit and Auction Gala on November 17. This year we pay homage to Dimitris Daskalopoulos, for his visionary approach to collecting -D.Daskalopoulos Collection- and the new models he has explored for exhibiting a collection. Sharing ICI's drive to work internationally, through a network of partnerships and collaborations, Daskalopoulos established NEON, a non-profit organization, a "foundation without walls" to provide support to artists and curators, reach new audiences through exhibitions and events, while creating an international network of cultural partnerships. In the first part of this conversation, Dimitris Daskalopoulos talks to us about his goals and motivation for establishing NEON, his motivation for collecting, and the meaning of a collection. What is the significance of the ICI Leo Award to you? It was very gratifying, unexpected in the sense that you go on you do what you believe you want to do and it is nice to find out that this is noticed and recognized by such a serious organization, which is also so far away from Greece. It shows how much the art world has become international and global. So it was a very gratifying surprise. With the Leo Award, ICI honors your "visionary approach to collecting" and the "new models for exhibiting a collection" you have explored. Tell us about NEON. The goals and your motivation for starting it. I've been a collector I am being told of a different kind. I was always collecting with a view and a conviction that art cannot belong personally to one person. I perceive my role as a collector to be that of a temporary caretaker and my collection as a repository being available to Museums for loans. It is human creativity that gets its meaning by being exposed and by creating emotions and thinking in other human beings. So, I was always open in my collection and NEON came as a natural development in that, because I really wanted to give the opportunity to the Greek public to come into closer contact with the ideas and the emotions and the stimulation that contemporary art can produce. I chose not to have a space and I chose to have this organization, which is not about my collection. It is about opportunities for the Greek public to come into contact with contemporary creativity. So, I chose not to have a permanent space on my own. I chose to go where the public can be attracted to come. And that is public spaces, open spaces in the cities, private institutions. An additional motivation for starting NEON is my belief that Greece's crisis, although mainly economic in its manifestation, was at its basis a cultural crisis. It is the culture of the last 30 years that got us into these troubles. Of course, cultural issues take decades to change but I do feel that I have an obligation to try to see that our children or grandchildren do not face a similar crisis for the same reasons. And I think that contemporary art with its ideas, and the problems it raises and incites people to discuss, is an important education for the Greek public. I also think that Greece has always been creative, and if it is going to tackle its challenges in the future it has to feel well about its present. It has been a country, especially in the cultural area, stuck in its past because of the great achievements of our ancestors, and we need to become more confident about our contemporary creativity. So it is not just about contemporary art, it is about the whole notion of being a risk-taker, being innovative, about what we do in our everyday lives. So this is the educational context where I am trying to put my activity with NEON. How did your collecting principles emerge over time? I was always very clear on what I like and what my collection is about. Amongst the themes that run through the collection are the notion of the body as a source of creativity and the vessel of existential, social and ideological struggle. Eventually, I realized that the principle of my collecting deeply grasped the Greek word, for collecting, which in Greek 'to collect' means 'to say something with'. Putting things in dialogue that speak with each other and speak together carrying the same central message. That helps you build coherence. I was always thinking about what was in the collection, what adds to this same theme, and same discourse. So I think I've been able to keep it coherent without making a collection that some times ends up like an accumulation of unrelated things. So there, it helped to be Greek and be able to ponder upon the depth of the word "speak together". In your earlier interviews, you talked about The Saviors of God (1927) by the Greek writer and philosopher Nikos Kazantzakis. Kazantzakis writes "We come from a dark abyss, we end in a dark abyss, and we call the luminous interval life." Could you elaborate on that? It was a great coincidence. I was always promising my team, a small team of trusted people that I work with, that one day I will sit down and write what it is that makes me clear about choosing an artwork and adding it to the collection, or rejecting an artwork. Then I remembered my Kazantzakis' readings and I went back to The Saviors of God and there I found it. And I said, I don't need to try to be a writer, there it is, and it is exactly what drives, motivates, and inspires me in collecting. So I just took the quotes and coopted them. The second part of this conversation (forthcoming) focuses on the impact of curators and museums, art-making and risk-taking, and the power of art even when we don't fully understand it.